Canaletto Walnut veneered exterior part, internal maple veneered shelves and back. Opening with two sliding doors, lacquered in two different colors. Four legs, cone shape, made of solid Canaletto Walnut. EvERYONE Sideboards W. 180 X D. 50 X H. 72 - W. 240 X D. 50 X H. 72 Finishing: Horizontal Tops, Lateral Sides and Feet Canaletto Walnut, Smoke Walnut Inside Maple ,Sliding Doors Matt Lacquered. 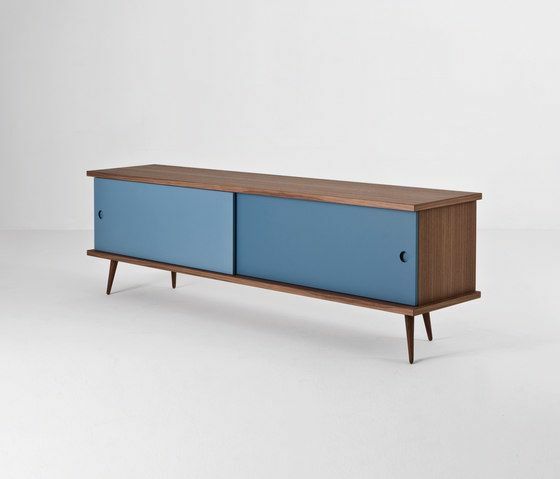 W. 180 X D. 50 X H. 72 - W. 240 X D. 50 X H. 72 Finishing: Horizontal Tops, Lateral Sides and Feet Canaletto Walnut, Smoke Walnut Inside Maple ,Sliding Doors Matt Lacquered.